The ultimate question is: will “The Last Jedi” answer all the other questions posed in “The Force Awakens”? Fans of both Star Trek and b-movie horror host Svengoolie will enjoy the show this weekend when MeTV airs the original pilot episode “The Cage” hosted by the Chicago Television legend! Which begs the question, will the rubber chickens be set to stun? Visit the MeTV website for programming info! With Star Trek marking its 50th anniversary this week, all of fandom has been celebrating the launch of the television series that inspired generations of science fiction lovers and created a lasting legacy. 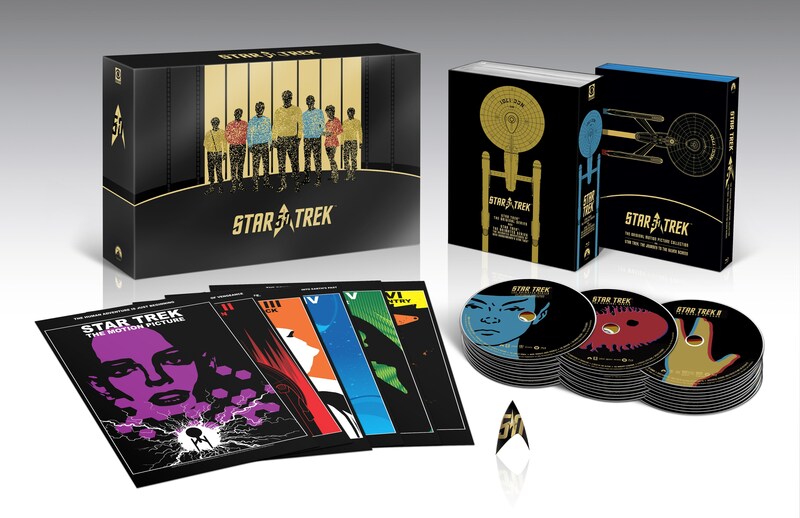 As part of the celebration, CBS Home Video is releasing a special collector’s edition blu-ray set that gives Star Trek fans a look at the series as they’ve never seen before. (I’ll be posting my review of the set in the coming week. There’s a LOT to check out!) They also had original series writers D.C. Fontana and David Gerrold doing interviews with different media outlets to talk about Trek and the new blu-ray set. Geek To Me: Have you had a chance to look at the set, and if so what do you think about it? David Gerrold: I’ve looked at some of it. It’s 30 discs, you know, it’s going to take a while to get through the whole thing. But I am so jazzed by the blu-ray remasters. If you have a good TV set – and most of us have 42 inches and up now – you’re actually seeing Star Trek better than it’s ever been presented before. I remember we would get the dailies for Star Trek the original series, and it was a 35 millimeter print, the same you would go to the movies (to see). It was crisp, clear, there was no grain, no jumping around, no scratches, and it was on a high quality projector, right? What you’re seeing on the blu-rays is as if you’re seeing (the dailies) but it may be even better because it’s been digitally remastered. For instance there’s a shot in “The Trouble with Tribbles” where Leonard Nimoy has some coffee on his velour at lunch. And you can see it, the coffee stain. Nobody ever noticed that before. So, I am so excited to actually have this high-quality version of Star Trek. Because Star Trek is iconic. It’s just one of the very best things that American television has ever created. As a science fiction fan, how can you not be enthralled? I’m excited, did I say that? The latest episode of Geek/Countergeek has Keith Conrad and I discussing Star Trek’s 50th Anniversary, the new blu-ray collection, and how money – or more specifically commerce – works in Gene Roddenberry’s utopian future. Just how much do garbage men make in the United Federation of Planets? FOLLOW KEITH CONRAD on TWITTER! Ever since he left Saturday Night Live, Andy Samberg has done a pretty good job of staying in the pop-culture limelight, breaking out like other former SNL cast members in new television and film projects. Now the Brooklyn Nine-Nine star has a movie coming out on Blu-Ray and DVD where he plays a pop star who is trying to remain relevant. The film is a comedy called POPSTAR: NEVER STOP STOPPING and it was written by Samberg and his Lonely Island homies. I’ve got the details about the Blu-Ray/DVD release in the following press release. And I’ve got digital copies to give away to a couple lucky Geek To Me readers! Universal City, California, July 12, 2016 – Andy Samberg stars in this hilarious comedy as a former boy-band member trying desperately to salvage his failing solo career, coming to Digital HD on August 16, 2016, On Demand on August 30, 2016, and Blu-rayTM and DVD on September 13, 2016, from Universal Pictures Home Entertainment. This side-splitting comedy goes behind the scenes as music sensation Conner4Real (Samberg) finds his popularity plummeting after a disastrous album release, leaving his fans, sycophants and rivals all wondering what to do when he’s no longer the dopest star of all. Popstar: Never Stop Never Stopping on Blu-rayTM and DVD comes with over an hour of outrageous bonus features, including deleted scenes, a gag reel, celebrity interview outtakes and more! July 21, 2016 – Twenty-five years ago, in one of the greatest road movies of all time, Geena Davis and Susan Sarandon rode to everlasting fame as two women who embark on a crime spree across the American southwest in THELMA & LOUISE – and on Aug. 21 and 24, they’re journeying back to more than 500 movie theaters across the country. For two days only at 2:00 p.m. and 7:00 p.m. local time, audiences can take the wild ride with Thelma (Geena Davis) and Louise (Susan Sarandon) all over again in a special THELMA & LOUISE 25th Anniversary celebration, presented by Fathom Events, Metro-Goldwyn-Mayer and Park Circus. This special two-day-only event also includes an exclusive all-new introduction from movie critic Ben Lyons. Directed by action master Ridley Scott (The Martian, Black Hawk Down, Gladiator) from an Oscar-winning screenplay by Callie Khouri, THELMA & LOUISE is an exhilarating, full-throttle adventure hailed as one of the best road movies of all time. Susan Sarandon and Geena Davis star as accidental outlaws on a desperate flight across the Southwest after a tragic incident at a roadside bar. With a determined detective (Harvey Keitel) on their trail, a sweet-talking hitchhiker (Brad Pitt) in their path and a string of crimes in their wake, their journey alternates between hilarious, high-speed thrill ride and empowering personal odyssey … even as the law closes in. In this latest edition of “Geek/Countergeek” Keith and I offer our reviews and reflections on the new Ghostbusters movie. How did it hold up next to the original films? Now I’m looking forward to the new television series! What did you think about Star Trek Beyond? Every Friday on “Pretty Late with Patti Vasquez” we play a game called “What’s in the Box.” In the game, callers are read online reviews for different products and must guess if it is for an appliance or an adult toy. The game makes for some very funny moments, and in this round, one of the Marines in attendance asked that I read one of my reviews as Yoda. 7/29/16 What’s in the Box? Give it a listen and have a laugh! The best thing about #StarWarsCelebration is reuniting with friends you haven't seen since the last convention, and making new friends along the way!